Research published in the journal, Science Advances, The first full assessment of risks to the world’s coffee plants shows that 60% of 124 known species are on the edge of extinction. found conservation measures were “inadequate” for wild coffees, including those considered “critical” for long-term global coffee production. The study found that 75 wild coffee species are considered threatened with extinction, 35 are not threatened and too little is known about the remaining 14 to make any judgement. Furthermore, it was found that 28% of wild coffee species grow outside protected areas and only about half are preserved in seed banks. A second study, in Global Change Biology, found that wild Arabica coffee can be classed as threatened under official (IUCN Red List) rankings, when climate change projections are taken into account. Its natural population is likely to shrink by up to 50% or more by 2088 because of climate change alone, according to the research. Wild Arabica is used to supply seeds for coffee farming and also as a harvested crop in its own right. Ethiopia is the home of Arabica coffee, where it grows naturally in upland rainforests. 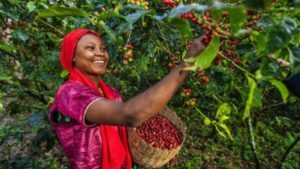 “Given the importance of Arabica coffee to Ethiopia, and to the world, we need to do our utmost to understand the risks facing its survival in the wild,” said Dr Tadesse Woldemariam Gole, of the Environment and Coffee Forest Forum in Addis Ababa. Many coffee drinkers are unaware that we only use the coffee beans from two species – Coffea Arabica and Coffea robusta – in the thousands of different blends of coffee on sale. In fact, there are 122 coffee species on top of that which occur naturally in the wild. Many of these wild coffees do not taste good to drink, but may contain genes that can be harnessed to help coffee plants survive in the future, amid climate change and emerging diseases that attack coffee trees.